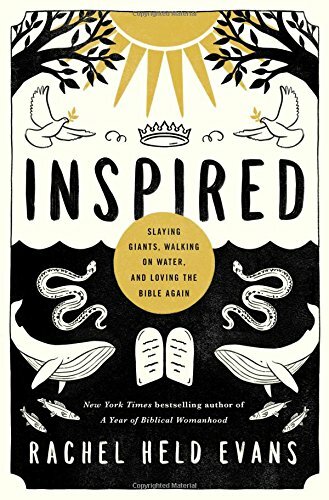 I was asked by brother Alf to consider reading and offering my thoughts on liberal Rachel Held Evans’ book titled Inspired. Usually I take a long time reading books I disagree with and posting about it on my blog since I want my critique to be accurate of their view, logically sound in my arguments and that what I say is true. Actually they don’t criticize my hermeneutics or my exegesis. They just say, “This woman has no authority to write about the Bible.” They don’t even attempt to engage the arguments that I make, and that’s what irritates me. Note here she said they didn’t handle her hermenuetics, her exegesis nor her arguments but attack her as a woman. In this post and future posts I won’t be attacking her as a woman. I also think Rachel Held Evans’ statements about her detractors thus far shouldn’t be attributed to all those who disagree with her; that would not be fair. I think thoughtful reviews of any books takes time, even responses to terrible books because it takes time to be fair and offer sound arguments against a book’s perspective. Her book was released on June 12th, 2018 and her statement in that interview was on July 6th. Sometimes in academia it takes months or even over a year before there’s a critique from the other side. So for her to say no one who is a pastor and in seminary has critiqued her hermeneutics, exegesis and arguments is rather premature. It’s also strikes me as a bit narcissistic for someone who is professing to write a book admitting she’s not a Bible scholar to think meaningful responses from pastors and those in seminary should be served right away (3 weeks) when others who are more serious scholars get their response much slower. In this post I will offer my thoughts on the “Introduction” for the book. Much of her introduction tells us of how much she was your idealized stereotypical American Conservative Evangelical teenager who grew up having a life verse, was president of the high school Christian club, leader at her church’s youth groups, representing the Bible club at her school’s homecoming court and going off to college that taught from the Christian worldview (xv-xvii). In her 20s she had doubts about the Bible, lost her faith a dozen times and “become something of a Bible bully” (xvii-xviii). While there’s a sense I appreciate her giving her background of where she’s coming from I think it is appropriate to warn readers to be cautious not to think her autobiography mean she understood the arguments and positions of scholarly Conservative Evangelical Christians from her high school and undergraduate experience. I was disappointed to see the footnotes of the book lack citations of any scholars of contrary opinion from my initial survey; it seems she too need to heed her own words that as a critic (of Conservative Evangelicals) she needs to engage with their arguments instead of attacking the person such as saying they are anti-woman, etc. Finally I can’t help but to note her journey as opposite of mine; I grew up in a very liberal part of the United States (Left Coast) in a non-Christian household and my college experience was at a very liberal reputable secular university but by God’s grace in my journey I became a Conservative Evangelical. I bring this up to make the point that readers ought to be careful of not just taking her experience as an argument for her position nor assume that every critic of Rachel Evans has a “deep insecurity” or have what she described from her experience as “a move-along-nothing-to-see-here quality to their arguments that only reinforced my suspicion that maybe the Bible wasn’t magic after all, and maybe, deep down, they knew it” (xviii). While that might describe some people that hold positions contrary to her view that is not the case for every individual. Over the course of the last decade, I have discovered my cover artists–those scholars and poets, traditions and practices, that help make the bible sing. From the rich history of Jewish interpretation, I learned the mysteries and contradictions of Scripture weren’t meant to be fought against, but courageous engaged, and that the Bible by its very nature invites us to wrestle, doubt, imagine, and debate. Liberation theology (which views the Bible through the lens of becoming free from unjust conditions) and feminist biblical interpretations showed me how the stories of Scripture could be wisely appropriated for social good by pointing us to justice. The spiritual practices of Lectio Divina and Ignatian meditation, which invite contemplative engagement with the text, helped me recover a devotional element to Scripture reading that had long ago gone missing. She does reveal a lot of her theological methods here. It yields much dividend to be aware of the theological method of someone you disagree with and also to critique it since it is one’s theological methods that leads one to arrive at one’s theological position. Note how her own theological method faces the problem of subjectivism. According to Evans in the first paragraph I quoted above the Bible is to be heard through the “cover artists” of one’s choice. These “cover artists” “remix” the Bible’s message in a way that she described as being the opposite of “squinting and studying” the Bible. Thus these “remixing’ is rather subjective. But if it’s all subjective and one can go about “remixing” the Bible according to one’s preference of one’s “cover artists,” there’s no point for her to criticize and make fun of someone else’s interpretation, something she does all too frequently. Her very theological method undermine her own criticisms of Conservative Evangelicals since if it is all subjective who should complain about what “cover artists” someone else prefer? Rachel “cover artist” approach also contradicts her own view “stop trying to force the Bible to be something it’s not” that she stated two paragraphs later. On the one hand one engages the Bible by doing new “covers” and “remix” of it in a manner that is explicitly described as the opposite of “squinting and studying” the Bible to get its meaning. Yet on the other hand she wants readers to not force the Bible to be something it is not, since what the Bible objectively is, matters. She’s a walking contradiction. To say it is “static” is unhelpful as it is ambiguous; even the most adamant cecessionist believes God’s Word is dynamic in the sense that the Spirit speaks through it and is dynamic to speak today. But of course Conservative Evangelicals believe it is “static” in the sense that Scripture remain God’s Word and endures so. What does she mean by static? And is that term used pejoratively? Evangelical doctrines of the Bible’s perspicacity is more nuanced than she probably realizes. It is not a denial that there are somethings in the Bible that is hard to understand while Scripture teaches that the Word of God is clear in many areas. Concerning the Bible’s view of certainty see the Biblical View of Certainty. Finally it is amazing that the Conservative Evangelical view claims to be the Bible’s own teaching of the Bible and yet often times critics of Conservative Evangelicals often fail to handle the passages that teach on the nature of God’s Word itself and the passages that speaks on the Word being “perspicacious, certain, absolute” (along with verses that nuanced the doctrines). I wonder if later in the book Evans deal with this. Although she complains that Conservative Evangelicals should “stop trying to force the Bible to be something it’s not” she is guilty of this herself. She thinks Liberation Theology and Feminist Theology are legitimate “cover artists” in their use of the Bible. But they impose foreign presuppositions unto the Bible in their theology. For instance Liberation Theology uses Marxists’ presuppositions as their starting point such as a certain economic theory and view of history. Feminism also impose a view of manhood and womanhood that is contrary to what the Bible teaches concerning the complementary roles between man and woman. Time does not permit me to do the legwork of documenting the foreign presuppositions imposed upon the text by Feminist theology and Liberation Theology. At minimum it is clear that the Bible is not a manual for liberation and revolution and the use of the Bible in that way is to force the Bible to be something it is not. For Evans Left leaning ideology gets a pass in their appropriation of the Bible but not Conservative Evangelicals. One can’t help but to notice the political and partisan dimension in her approach towards the Bible. I also don’t know why on page xviii she had to tell us she voted for Barak Obama even though it had nothing to do with anything. Evans also support “practices of Lectio Divina and Ignatian meditation” which are also imposing something that is unbiblical. Check out this post on Catholic contemplative prayer. Evans stated that she regards Old Testament scholar Peter Enns “as both a mentor and friend.” Elsewhere in the introduction she also noted his influence on her. However Enns’ theological method itself is problematic in his handling of the Scriptures. My critique of his method can be found here: A CRITICAL EVALUATION OF PETER ENNS’ THEOLOGICAL METHOD IN HIS FORMULATION OF THE INCARNATIONAL MODEL OF SCRIPTURE. Already in the introduction one can see Rachel Held Evans is off to a bad start. I don’t think Rachel should be tempting people to examine her hermeneutics. When it comes to the hot-button stuff, they’re about as strong as a gossamer curtain. I sometimes say to people, “I read these awful books so that you don’t have to.” Does that resonate? I totally resonate with you here Lee! This is one of those times I’m doing exactly what you described: “I read these awful books so that you don’t have to.” For those that I pray need help and are looking for answers online…. Yeah, we never know who might be reading. Thanks for reading that wolf’s book and helping expose her for the fake she is. She hates the Bible yet pretending to like it is part of her “Christian” Left persona. She’s about as Christian as Bart Ehrman, but he’s at least (somewhat) more honest than her. She basically equivocates on all her key terms. Take the title, for instance. She uses a key theological term (“inspired”) but once she starts typing it obvious that she thinks the Bible is anything but. Yep the double speak and equivocation is incredible; but her being a witty word smiths is not enough when there are fallacies and contradictions in her methods and views. Pray for me as I read through this book and write posts on it. Oh…I am so tired of feminist pushing their sinful thoughts on the masses. Of course their mentors and friends are on the same broken path. That ‘s why they have such a love affair. Thankfully there are some out there to challenge them . Thank you Beverly. Off tangent, was praying for your sister, how is her health doing? Her eye sight has improved. She goes back to Dr. this next week to find out about her shoulder ( rotater (sp ) Probably surgery will be required and this complicateds her life. She has a stroke patient ( husband ) to care for. Hopefully he can go to VA for a couple of weeks then ?? ?He is totally dependent on her…can’t do or communicate at all…going on 7 years. Thanks for the review of the book’s intro. I’m looking forward to future installments. Yes, as you point out extremely well, liberals/errantists often use the very same tactics they accuse believers of. Did you catch her endorsement of the Catholic practices of Lectio Divina and Ignatian meditation? They are the hot fads within pop evangelicalism. “Did you catch her endorsement of the Catholic practices of Lectio Divina and Ignatian meditation?” I did! That can be another post in of itself, there’s too many problems to write about and I realized almost all my day has been spent writing what was found in this post alone so I eventually pressed “Published!” You should do a post on your blog in response to the quote mentioned concerning Lectio Divina and Ignatian meditation since you know more about that area than I do, I would later edit this post and give a link to your post if you don’t mind. Yes, will do! I’ll put a post together this weekend. LOL! You’re very brave, Slim. I appreciate your taking the time to do this. Thanks for reading such books so that we wont have to. ” that’s just your opinion”. The constant refrain of the modern liberal, concerning biblical truths. They deny absolutes with subjective nonsensical slogans. ” It is absolutely true that there are no absolutes” or ” there is no true truth”. They assert that faith and reason are incompatible when the opposite is true. Liberalism and reason are incompatible. In fact it is liberals who reject logic. they reject it because it lead to absolutes. using sound hermenutics the bible cannot be made to mean what you want it to. Only by starting with a bias to prove what you desire to prove, can the bible be twisted to say that which you hoped it to say. Thank you, Pastor Jim – good thinking and needed analysis. So glad I read this! Great stuff, Jim. When I eventually get down to doing my review I will link to yours and your material on Enns. Thank you. Thanks Alf for jumpstarting this post and endeavor, I look forward to your review. The tweet is quite informative of Evans’ outlook. BTW, this sums RHE up pretty much. SLIMJIM is tackling another book which is trying to undermine the authority of the Bible. Thank you, SLIMJIM! “Convoluted” is one word I would use to describe Rachel’s writings. I pray that Jesus would help her to sort through the complications of her life. May she return to the simplicity of His ways. I’m encouraged to hear of your prayers for her. If the Lord moves you to it pray for me too as I write more posts refuting her book, that I do so accurately reflecting her views, that I use Scripture properly and I am gracious while being logical. I’ve read from part 1 to part 6. For others reading this, it is worth persevering through it. Very thorough job SlimJim! Think how privilege this white girl social justice warrior is…could write on Christianity without higher degree of education and be a best seller. Yet her work is problematic. Why do you hate on Rachel Held Evans? Its so un-Christian of you. I hope you open up your mind up in 2019. Seriously glad for this resource. Couldn’t word it myself with what’s wrong with this book but your series was helpful.